Lignans are estrogen like compounds found in many plants. Lignans are compounds with a structure like estrogen; they are found in many foods, but particularly in flax and sesame seeds, and one hundred percent whole wheat flour; the latter alas is very difficult to locate as it goes rancid quite quickly. The best solution is expensive; buy your own grinder. Because cancers have a predilection for metastasizing to the spine, this is important for all chiropractic patients; everyone. Plant cell walls have many phytosterols which are estrogen like substances that are very beneficial to all animals, including us; one of these is the class called lignans. They are found prolifically in nature. 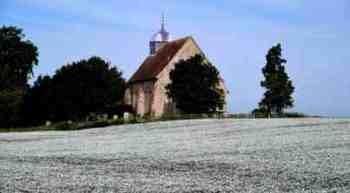 For example, you'll see fields of flax and rapeseed with their beautiful blue, white and yellow flowers in the summer. Most of these foods sadly go to feed animals, folk not knowing that the vital nature of the anti oxidant properties are for us too. There will be less cancer and the pain of arthritis if you keep up a steady, daily amount of these nutrients in your diet. The other phytoestrogen is a class of compounds called isoflavonoids, found mainly in legumes like green beans and soya products; for example, in tofu and also in chickpeas. Together they are known as phytosterols and phytoestrogens. Both lignans and isoflavonoids are vital in the diet. If you are not eating them, you can be sure you'll have to be on statin drugs all your life to lower cholesterol. They are a significant part of those foods that lower blood fats naturally. Add to that their anti inflammatory effect and you'll realise the importance of these substances for anyone suffering from chronic pain. Don't forget the oleocanthal in extra virgin olive oil too, in this regard. Lignans block the cancerous effect of estrogen on the breast; they are found especially in flax, 100% whole wheat and sesame seeds; every woman must eat them daily; every chiropractic patient. They are also found in whole grain foods. In other words, white bread, cakes and cookies, and pasta made from white flour have little of these compounds. Other high fibre foods like vegetables, salads and fruit are also rich sources of them. Skip the next three paragraphs if you have no chemistry background. 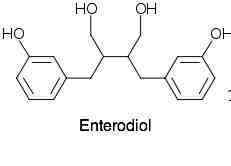 They are phenolic compounds, meaning they have a carbon ring with an OH structure; these phenols are also found in extra virgin olive oil, but have been extracted from the refined olive oils. Does your olive oil have no burn at the back of the throat? Buy extra virgin next time. Likewise they have been removed from the seeds in the production of flax and sesame oil too. The rule of thumb is, eat your food as unprocessed as you can. Then bacteria in the colon break down these organic substances to other forms such as enterodiol which is then absorbed. See the ring and the oxygen and hydrogen groups in the structure above? That's a phenol; just for those with a biochemistry background. There is a huge amount of research going on worldwide on their value in the human diet. For example, the German cancer research institute, after deep studies into the nutrients in unrefined olive oil, declares that food having large amounts of them gives protection against prostate, large bowel and breast cancers. And presumably others too, only these are the ones that have been researched. Likewise, Fang and colleagues from the Max Planck Institute have found many glucosinolates and lignans in rapeseed. But they discovered, that when processed into oil, also known as canola, most of the beneficial substances have been removed. Well, that's not entirely true. Rapeseed for human consumption remains controversial, but canola is rich in omega 3. For a comprehensive article on the phytosterol lignans and isoflavonoids read the Journal of Nutrition research by JW Lampe in the 2003 edition. So, rather get your antioxidants from your food. There's an embarrassing amount of research coming out that taking them from a bottle actually accelerates cancer. In the January 2014 edition of Scientist, Swedish researchers report that taking vitamin E, for example, actually increases the risk of lung carcinomas. In your food, there are eight different forms of vitamin E. But in a bottle you usually get the processed variety only, alpha tocopherol. It has some excellent functions, but it also competes with the cancer preventing gamma isomer. Forget the chemistry, just don't take vitamin E from a bottle; eat whole grains and legumes. A few pole beans in the garden would be a good start this summer. Study the flax seed nutrition information and you'll see that it's benefits are not only the omega 3 that flaxseed is famous for, but also that it is a rich source of flax hull lignans. Get it? Not in the oil but in the whole flaxseed only. Just as in the wheat grain, most of the phytonutrients are found in the kernel and bran, so these nutrients in flaxseed are found in the hull. Actually I've never seen dehulled flaxseeds, but if you want flax hull lignans don't buy the flax oil at ten times the cost, don't buy flax hull ligns in a bottle at one hundred times the cost. Grind them yourself, it's so easy. You want flaxseed oil with the full Monty? Then order one of the cheapo coffee grinders from Amazon at around twenty dollars and source out raw, whole flaxseed in your neighbourhood. They cost less than a dollar per pound here in South Africa; that goes a long way, and it takes about ten seconds to whizz the seeds up so that you have the real McCoy; flax hull lignans also the richest vegetable source of omega 3. Flax seed nutrition information tells you what else is in this wonderful seed, most of which goes to animal food, and especially the fibrous lignans. A tablespoon of freshly ground fax seed on your muesli every morning is so easy. Add it to your cookie and cake recipes, to your bread baking; it has a very mild, pleasant, nutty flavour. Call it super lignan flax oil, call it flaxseed, whatever, just grind the raw seeds yourself. Don't eat them whole by the way. Not only will they pass through the intestine untouched but they may get caught in diverticuli. Flax seed nutrition information will tell you most of what you need to know. How to make tahini is only for those who have no local Greek or Lebanese shop. 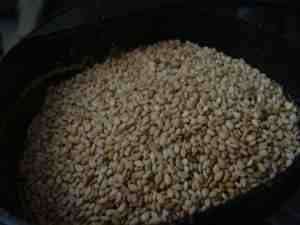 It's made from sesame seeds and is so inexpensive that it's not worth making yourself; and I've tried. It's loaded with lignans. Yes, sesame seeds too are a rich source of them, but have one tenth of those in flaxseeds according to Dutch researchers and they too pass through the digestive system untouched unless you grind them. If you want to enjoy a sesame bun, then you have to "fletcherise". Chew each mouthful 32 times to crack the hull so that your digestive enzymes and the bacteria in the colon can get at the goodies inside. They're locked up like the crown jewels in the Tower of London to prevent them oxidising! I used the same coffee grinder that I use for flaxseed when I wrote this how to make tahini page. Tahini is a paste rich in sesame lignans. Never heard of tahini? You're missing out. Our sesame tahini page tells all. Tahini is used extensively in Mediterranean cooking, for example in this authentic hummus recipe. Just one of the reasons why the people of the Med have so much less heart disease. I just love tahini straight on a salad, or on bread instead of peanut butter. Peanuts do have phytosterols too, but a very small amount compared to flax and sesame seed. One three thousandth. 1/3,000. 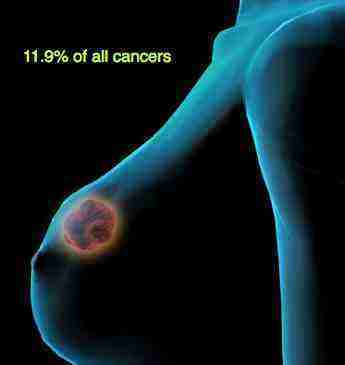 It's all about making sure you're not one in eight women who get breast cancer. Or your husband prostate cancer. Probably the most important reason to include flax and sesame lignans in your diet on a daily basis is their protection against breast and prostate cancer especially; I now often grind them together because of their anti estrogen properties. By competing with oestrogen at receptors in the breast, and effectively blocking these hormone sites, these phytosterols greatly reduce your risk of cancer. The prostate cancer and lignan link is now well established; these hormone like plant substances block the noxious effects of testosterone in the prostate gland, for example. But equally important is the lycopene research. Read more about how a tomato a day gives fifty percent protection against the most malignant nasty that men die from. Of purely anecdotal value, my doctor phoned recently after a routine PSA test; he was astonished that it was 0.9. That's extremely low for my age said he; I attribute it to the lignans that we eat daily in our wholesome food. Once again, as a famous heart surgeon recently said, return to the food that your grandmother served, and forget all the lessons that your mother instilled in you about food. He points out that fast foods, supermarket foods are largely deficient in these vital nutrients; worse they are highly inflammatory. Despite all the advice about cholesterol, and the statins folk are taking, when he looks down blood vessels he finds they seem to get redder and more angry every year. That's inflammation for you. Whilst they are found most abundantly in flax and sesame seeds, they are also in many other foods like beans, broccoli and the brightly coloured fruits like strawberries. Because there are so many different types, with differing properties, it's important to source them from as many different foodstuffs as you can. Whether it's growing green beans in your own back garden, enjoying tofu nutrition or discovering the interesting facts about strawberries for example, you are investing in a life without cancer. Queen of the anti cancer table can be easily filled with a lesson on how to grow broccoli. 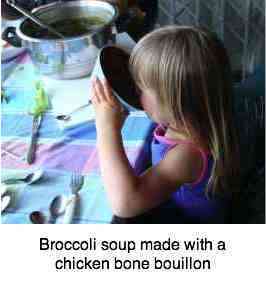 Here's a small girl tucking into her broccoli soup; it's just delicious. Jup, she is my granddaughter. Incidently, research at Harvard shows that the collagen gelatine extracted from chicken bones makes a powerful anti inflammatory. Chicken bones stock makes the perfect bouillon for your vegetable soups. The breast and prostate are particularly sensitive to high levels of circulating hormones; enter foods rich in lignans. You can read more about these very serious, and highly prevalent carcinomas at our breast cancer and prevention page; and prostate gland health. Why on earth all this about lignans on chiropractic website you may well ask? Good question. Firstly, because it's all about healthy living tips, but secondly it's wearisome in the practice faced with many patients on statins who have aching legs, thinking they need chiropractic for a pinched sciatic or femoral nerve. But no, all they need is to add foods that lower cholesterol to their diet; simply by adding 100 percent wholewheat, with its lignans, helps improve your blood chemistry. And thirdly, yes it happens at the Chiropractic Coalface occasionally, we have to break the news that the pain is not from a sacroiliac lesion, but from prostate cancer. Think lignans if you want to sit under those trees you once planted, sipping tea and watching your grandchildren grow up. Foods that lower cholesterol is a far more interesting subject than foods to avoid high cholesterol. If you eat your lignans you can have your butter and eat it. One of these is from our own mill; the other from the shop is also described as 'whole wheat flour'. Which of them has much of the lignans removed? The bran in wheat helps prevent colorectal cancer. Research published in the journal of Nutrition indicate that lignans play a part is this inhibition of cancer. Get smart and enjoy it in your 100% whole wheat flour. Lignans are involved in the antitumor activity of wheat bran in colon cancer SW480 cells. Note well, however, that millers are permitted to call their flour "wholemeal" provided no more than 40% of the germ and bran have been removed; all the best parts. Buy only "100%" wholemeal flour. We use it to bake fresh bread every day. If you're serious about bread, buy your own wheat mill; they're expensive. These days I'm making mainly a sourdough bread which I find tastier and more digestible. Or make this vegan seed bread variation, and of course use only butter, not margarine, and freshly ground flax. I make bulgar wheat mainly because it's what I was brought up on by my Lebanese nanny; for making tabouli that was one of her favourite dishes. But frankly it's a schlepp even if you have a wheat grinder, and in principle is there a difference? I absolutely adore tabbouleh bulgar wheat but these days I tend to make it only in honour of the memory of Josephine. But regularly we'll have tabouli on bread. When I do make bulgar wheat then I make plenty and freeze it; it too is loaded with lignans but no more than our 100% wholemeal bread. 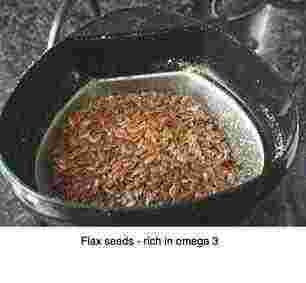 Anti inflammatory omega 3, mostly found in flaxseed if you're hunting for a vegetable source. 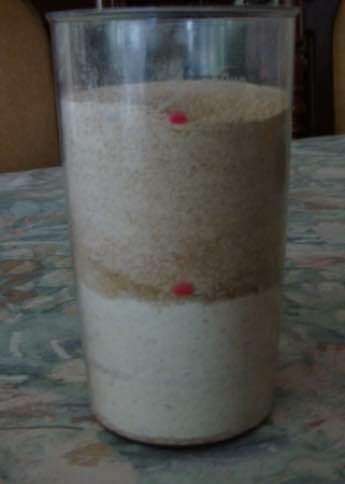 Return from lignans to healthy flour.